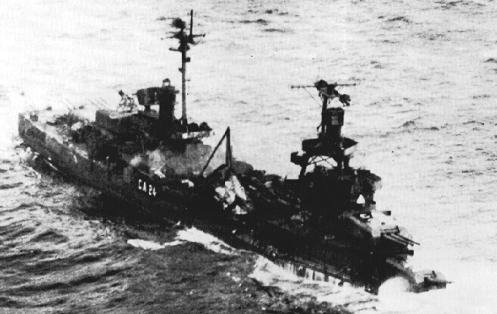 Fate: Sunk as target on 10 NOV 1948 off the coast of Washington. 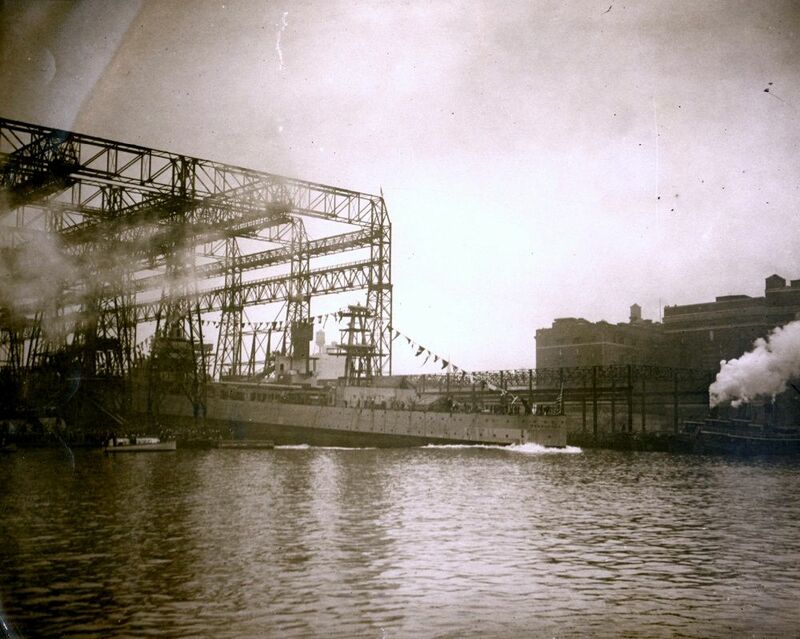 0402454 157k Members of the crowd, at the Brooklyn Navy Yard, watch as the Pensacola (CL 24) slides down the ways on 25 April 1929. US Navy and Marine Corps Museum/Naval Aviation Museum, Photo No. 1986.049.002. 0402455 148k Water view as the Pensacola (CL 24) slides down the ways and enters the water for the first time on 25 April 1929. 0402456 140k Water view as the Pensacola (CL 24) slides down the ways and enters the water for the first time on 25 April 1929. 0402457 133k Tugs catch and tow the flag dressed Pensacola (CL 24) after her 25 April 1929 launching. 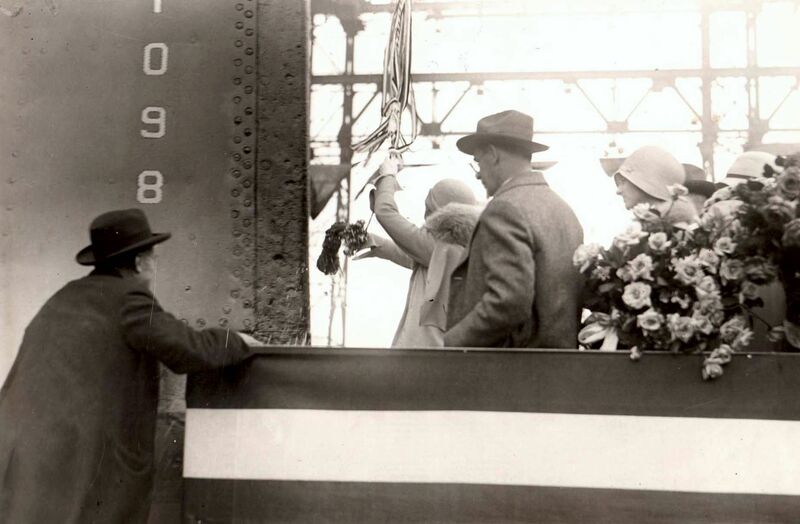 A prize was awarded to the first tug that caught the ship after launching. 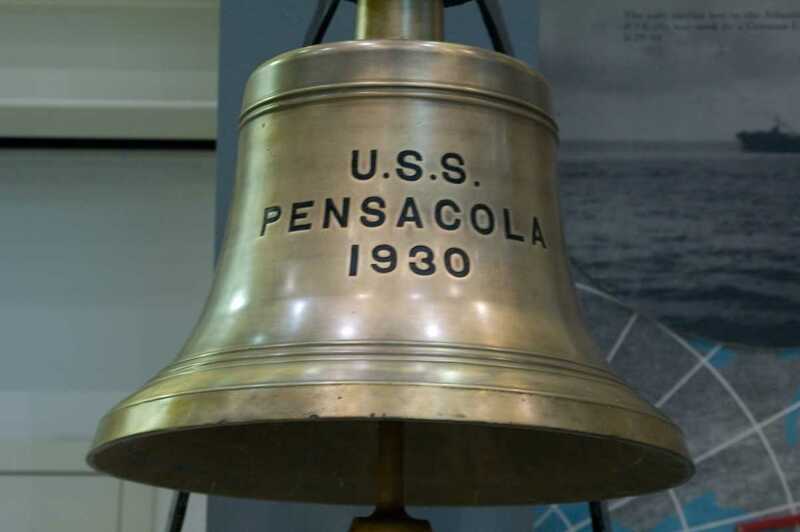 0402458 86k Launching ceremonies are complete for the Pensacola (CL 24) and the flag dressed ship is moored waiting for fitting out to begin. 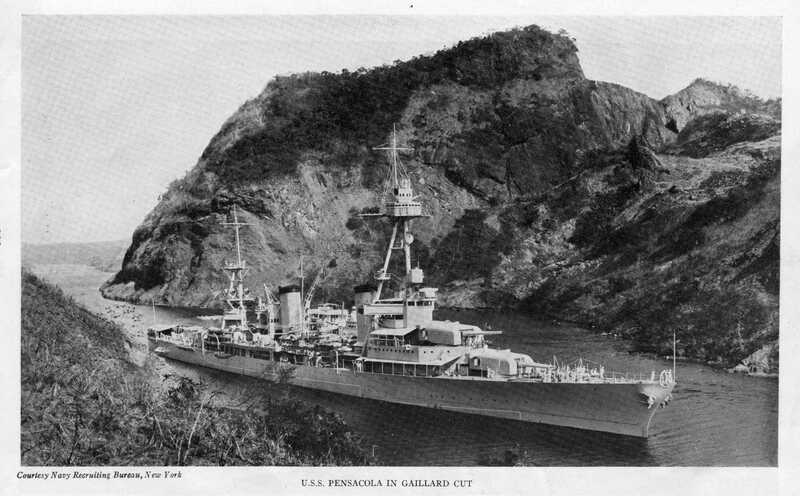 Undated port side photo while at anchor. Note the two cruisers behind her. 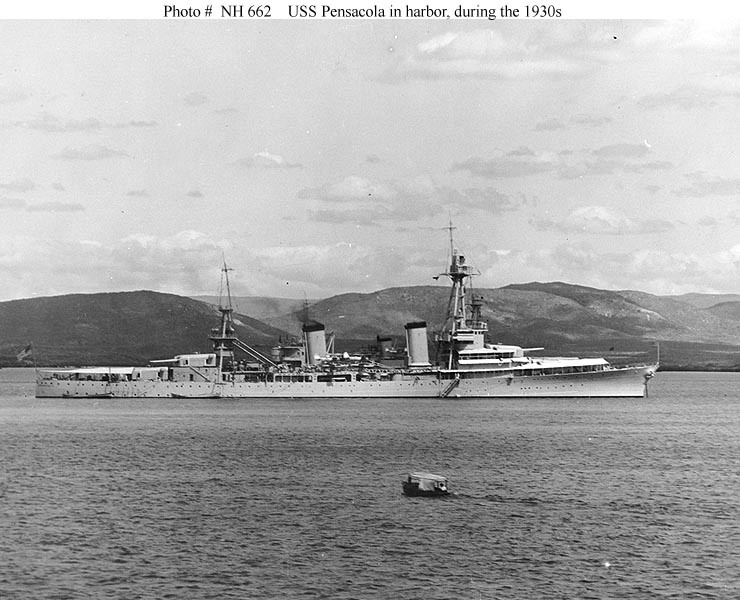 USS Pensacola (CA 24) Photographed at anchor, during the 1930s. U.S. Naval Historical Center Photograph #NH 662. 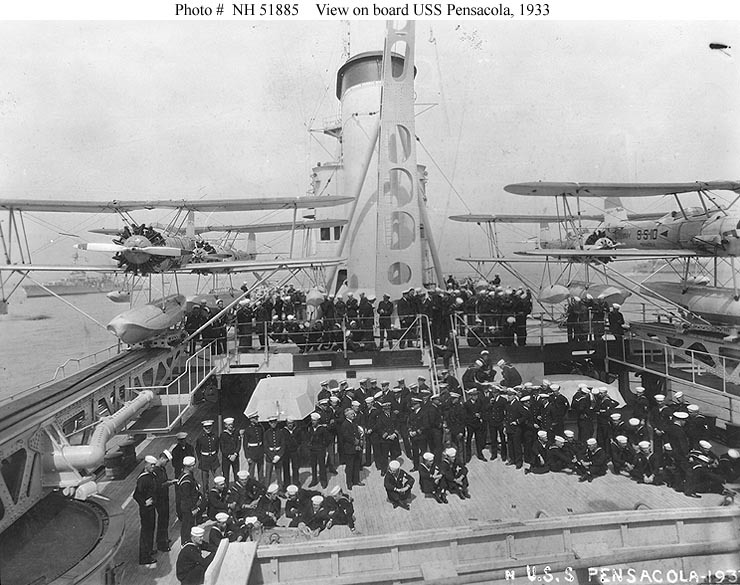 USS Pensacola (CA 24) Officers, Sailors and Marines in the ship's midships well deck, 1933. Note details of catapults, and the four Vought O2U-4 floatplanes. The plane at far right is Bureau # 8334. U.S. Naval Historical Center Photograph #NH 51885. 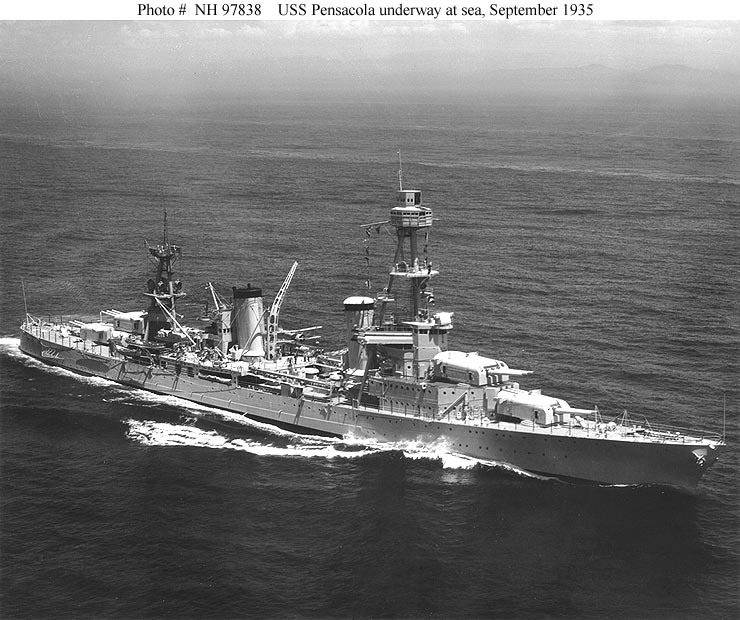 USS Pensacola (CA 24) Underway at sea, September 1935. 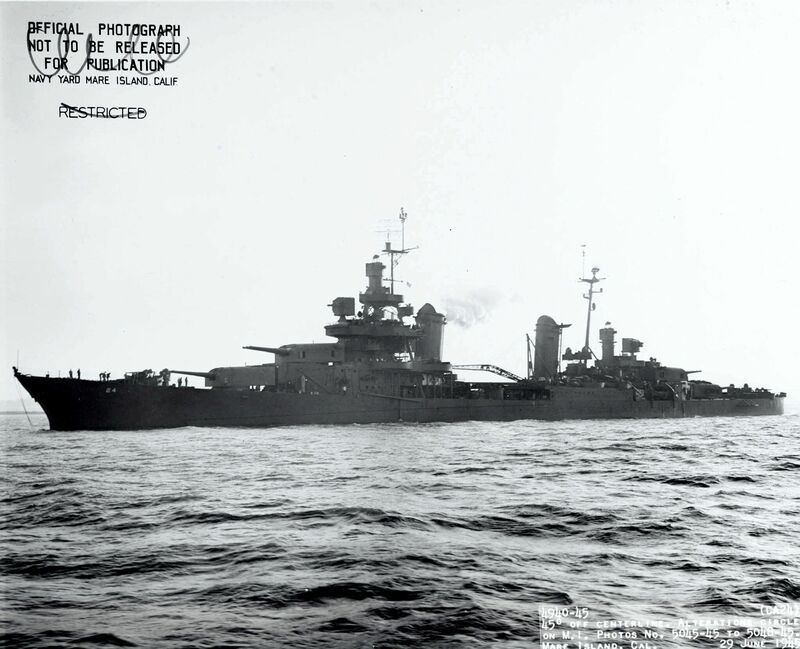 Official U.S. Navy Photograph, from the collections of the U.S. Naval Historical Center #NH 97838. 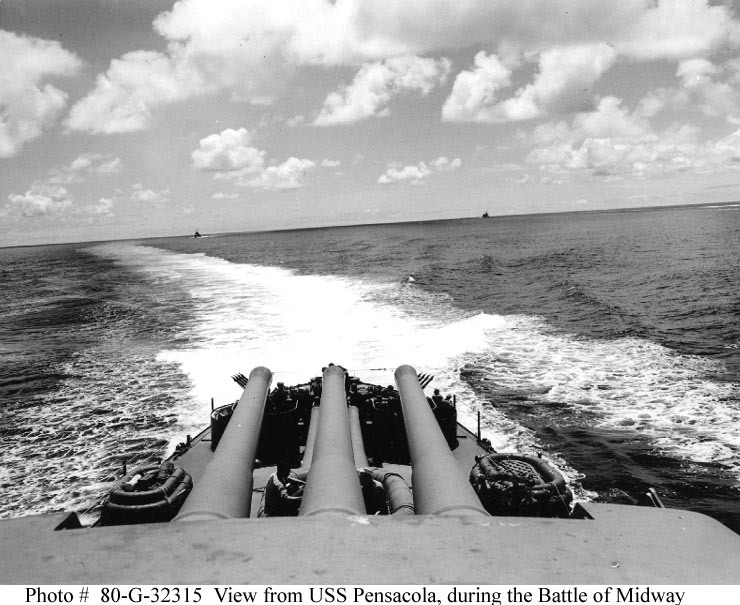 Battle of Midway, June 1942 - View looking astern on USS Pensacola (CA 24) as she steams to the aid of USS Yorktown (CV 5) during the early afternoon of 4 June 1942. 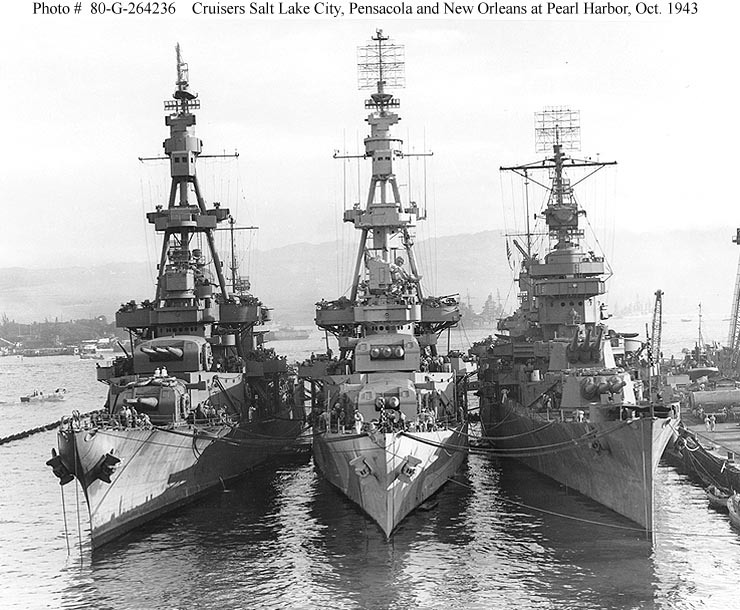 Ships following are probably USS Benham (DD 397), at left, and USS Vincennes (CA 44). Wake at far right is probably that of USS Balch (DD 363). 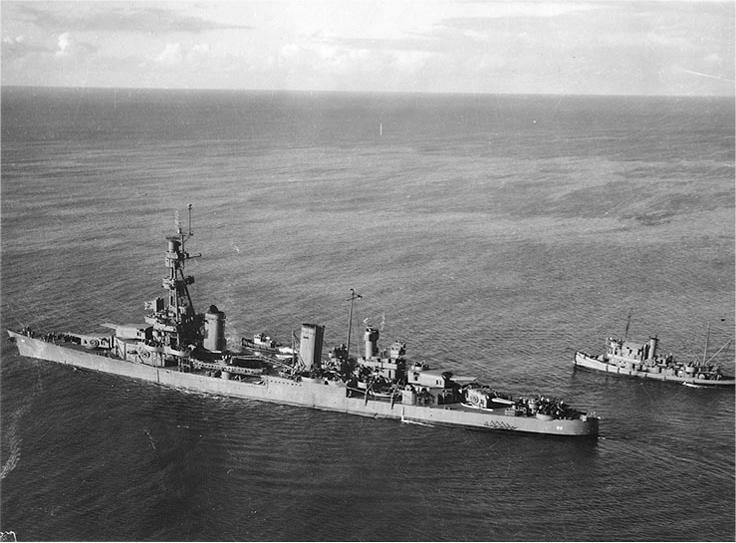 These four ships were detached from Task Force 16 to augment the screen of the nearby Task Force 17 after Yorktown was hit and temporarily stopped by Japanese dive bombers. 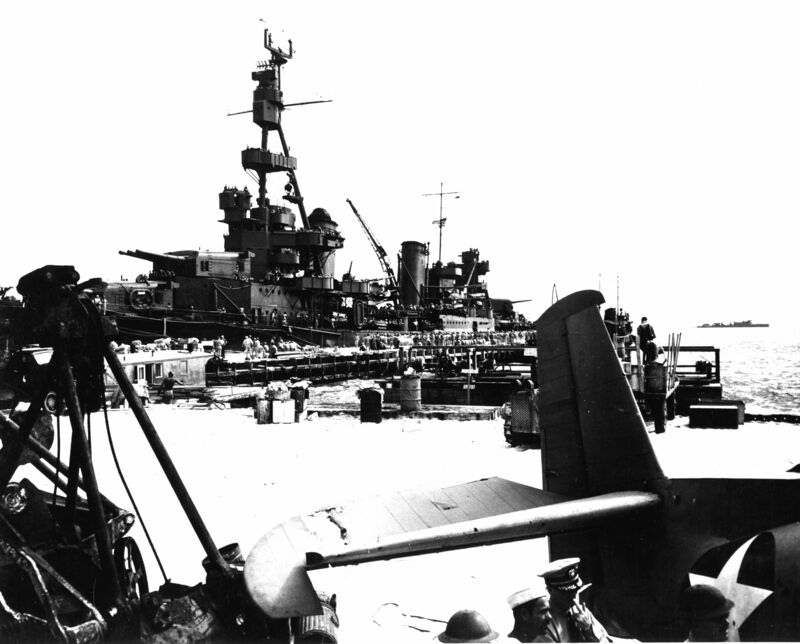 USS Pensacola (CA 24) bringing in U.S. Marine Corps reinforcements to Midway on 24 June 1942. 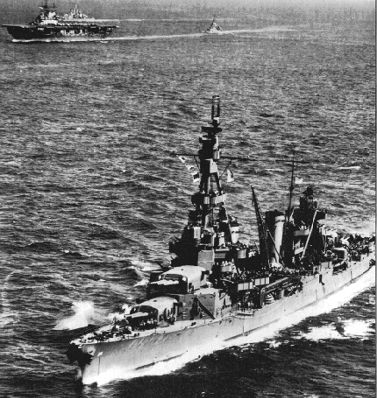 USS Ballard (AVD 10) is visible in the background. In the foreground is the tail of Ens. Bert Ernest's Grumman TBF-1 Avenger (BuNo 00380). 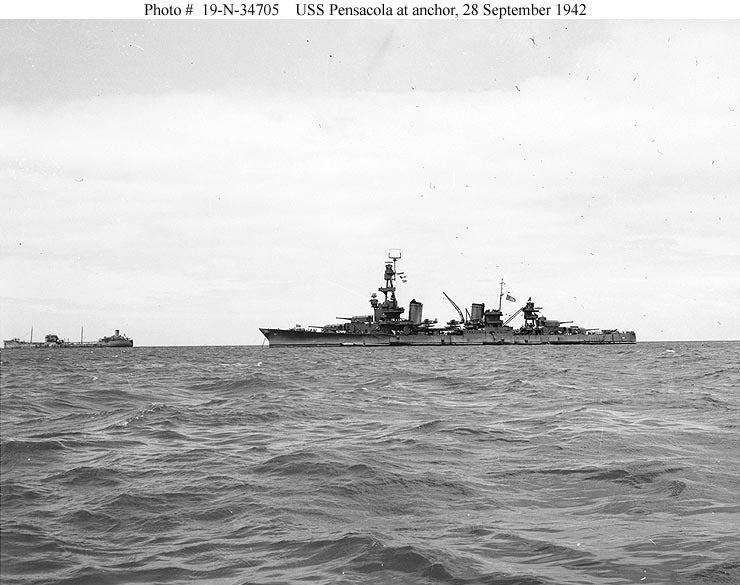 USS Pensacola (CA 24) At anchor in a south Pacific port, 28 September 1942. An oiler (AO) is in the left distance. 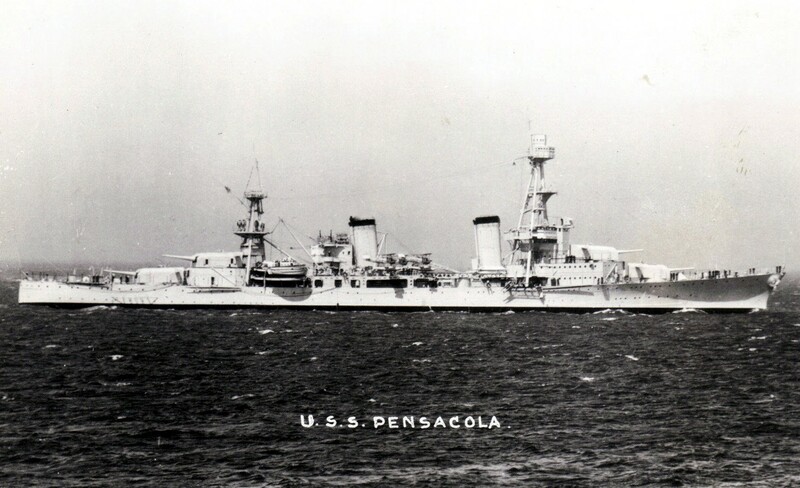 USS Pensacola. Close up of damaged area. 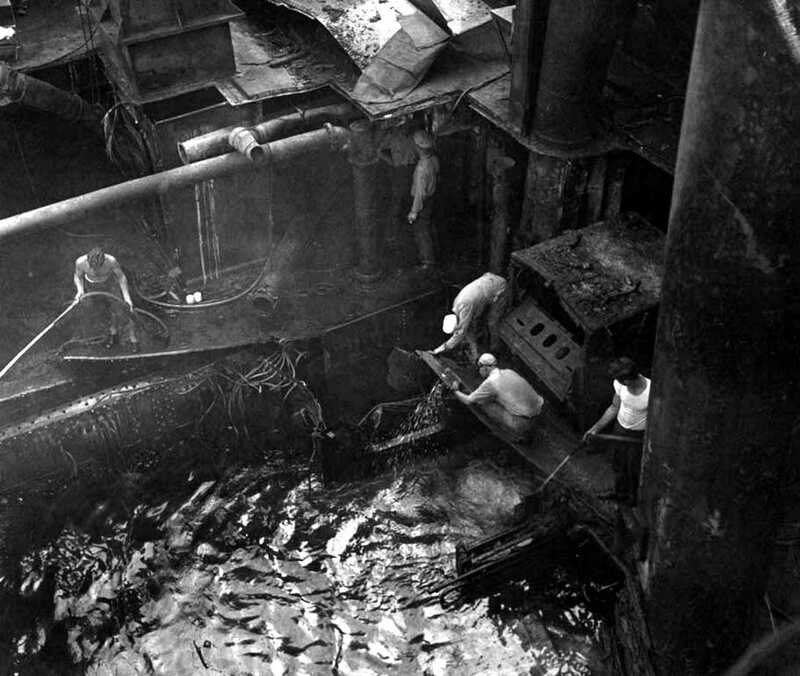 USS Vestal repair men cutting away wreckage. Man with hose is immediately over after engine room. 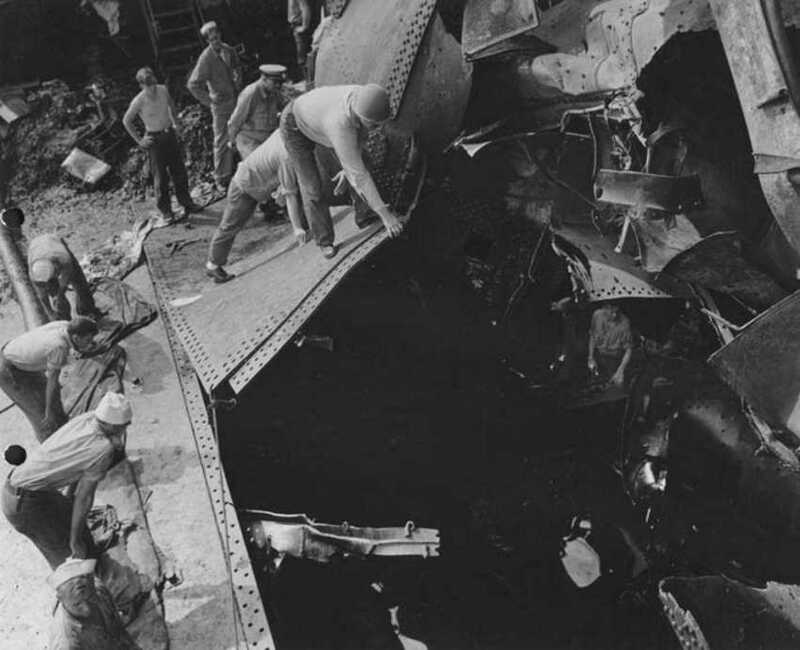 Hole made by torpedo after wreckage had been cleared away. Outer bulkhead of number three turret's barbette. 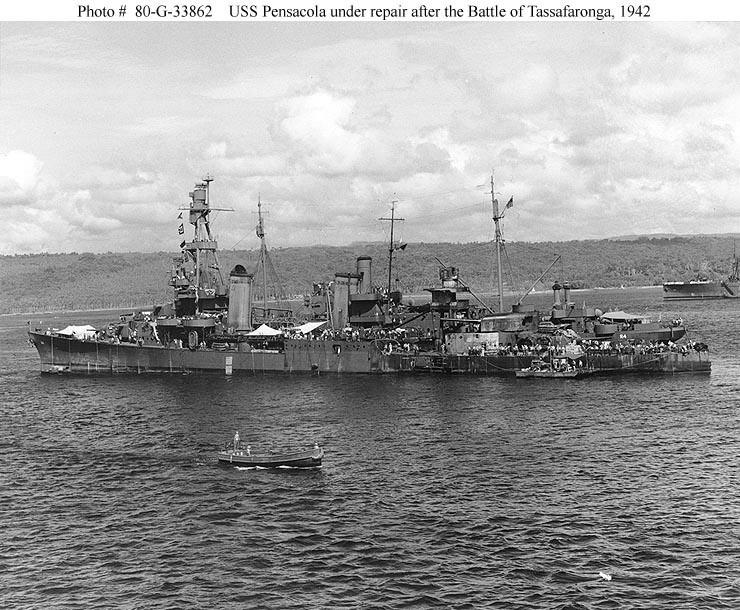 USS Pensacola (CA 24) alongside USS Vestal (AR 4), undergoing repair of torpedo damage received during the Battle of Tassafaronga, off Guadalcanal on 30 November 1942. 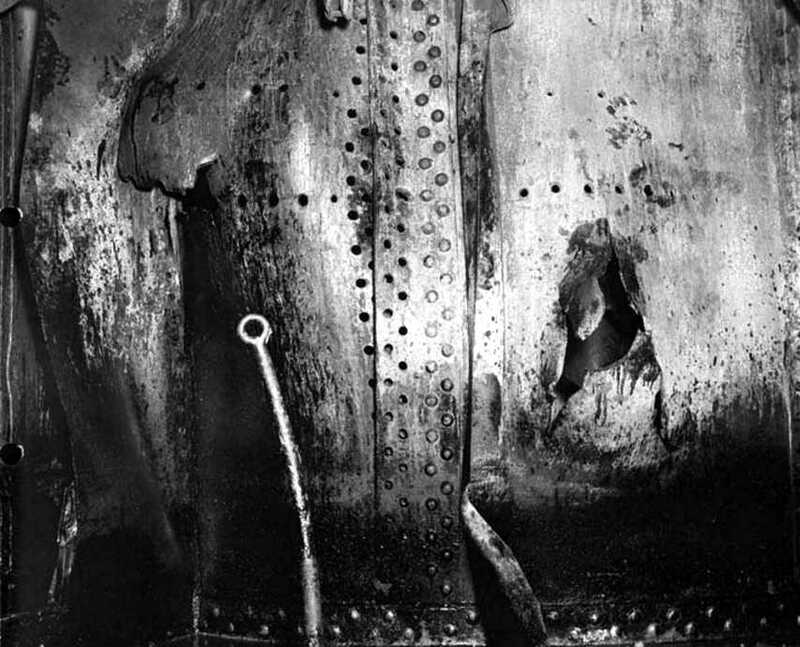 Note the hole in her side below the mainmast, and the extensive fire damage in the area of that mast and the number three eight-inch gun turret. Photographed at Espirito Santo, New Hebrides, on 17 December 1942. 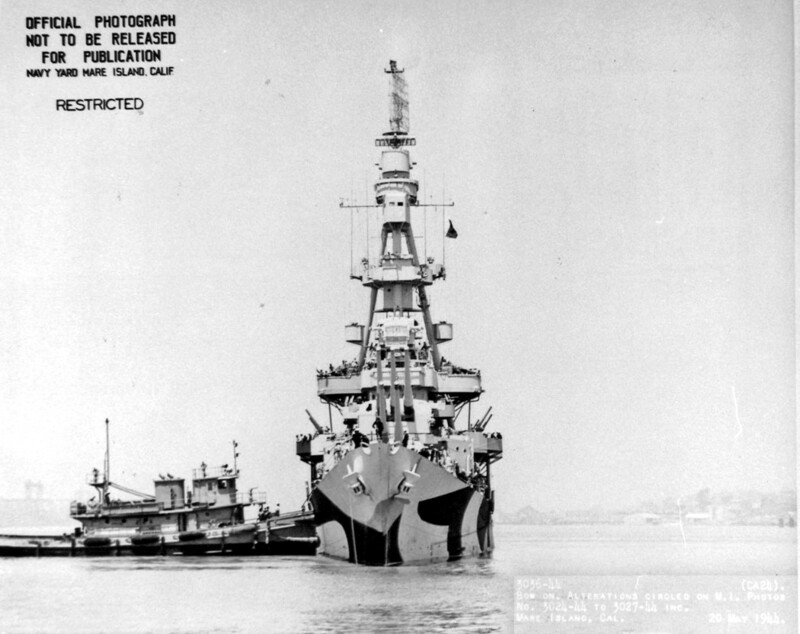 Official U.S. Navy Photograph, now in the collections of the National Archives #80-G-33862. 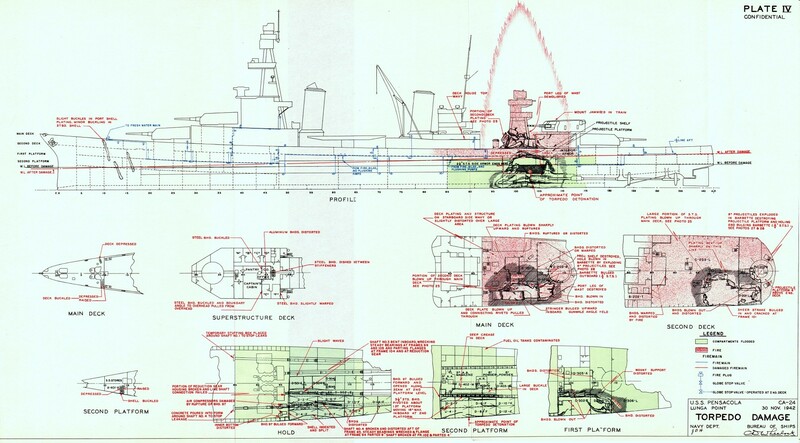 Torpedo damage diagram of USS Pensacola (CA 24) from hit off Lunga Point on 30 November, 1942. 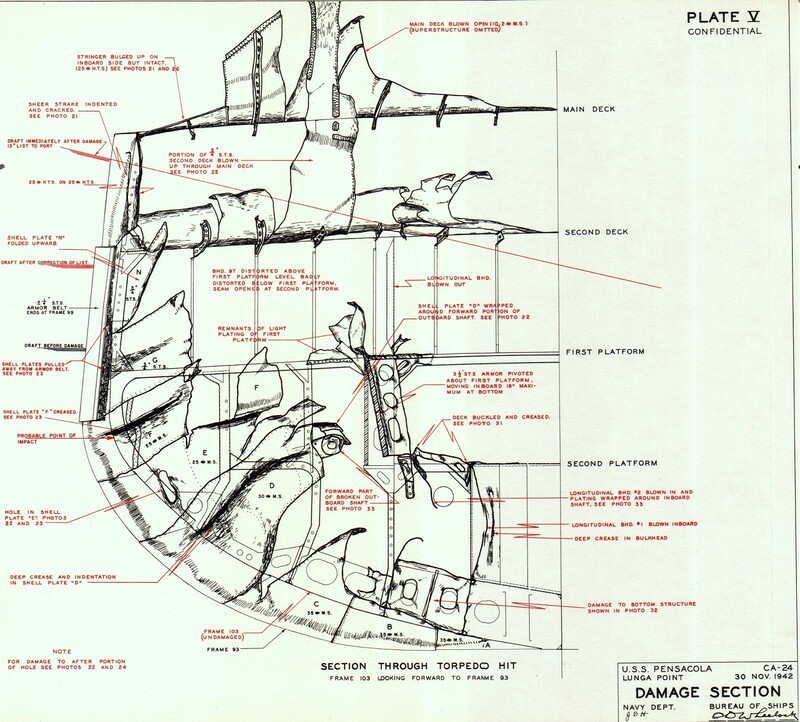 Section damage diagram of USS Pensacola (CA 24) from torpedo hit off Lunga Point on 30 November, 1942. Flooding diagram of USS Pensacola (CA 24) after torpedo hit off Lunga Point on 30 November-1 December 1942. 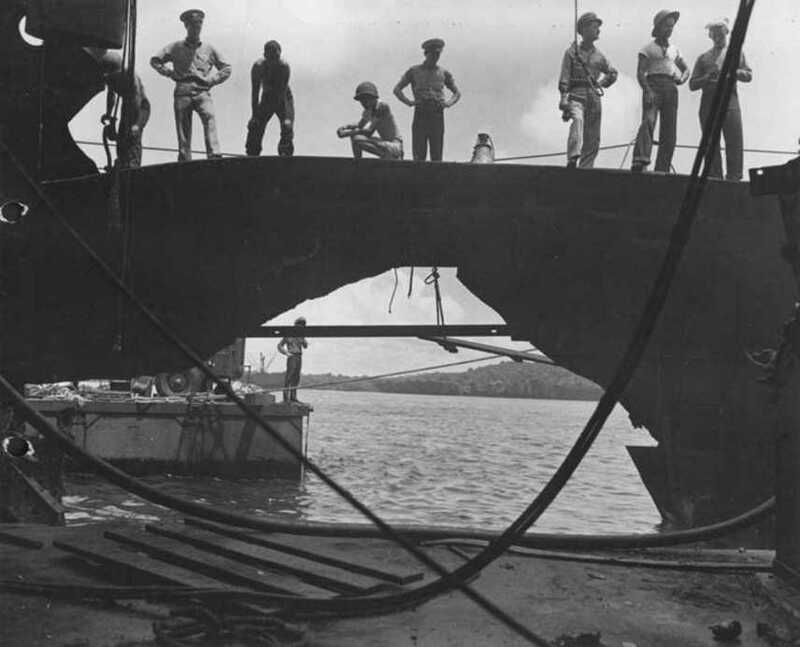 Preparing for the removal of 8" turret #3 while at Pearl Harbor Navy Yard on 29 January 1943. 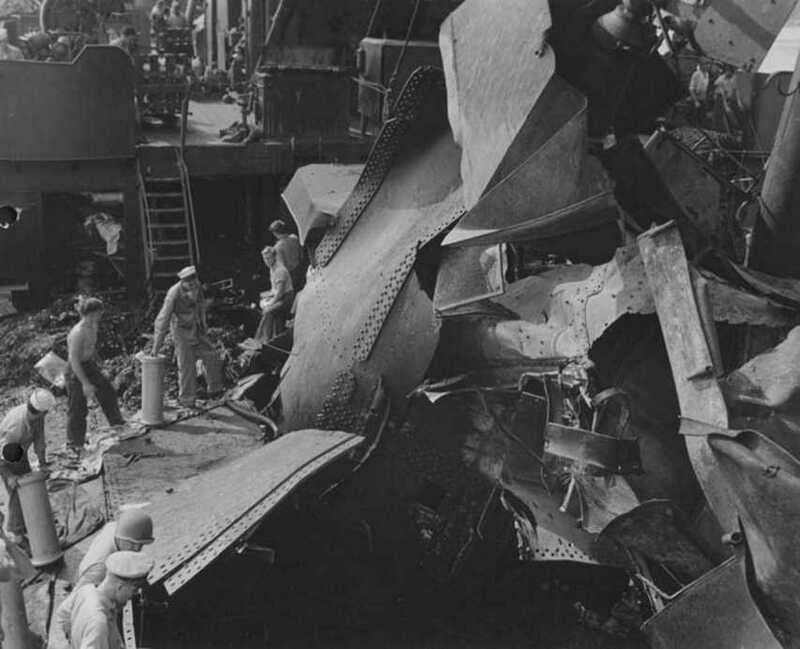 The turret was damaged during the Battle of Tassafaronga, off Guadalcanal on 30 November 1942. 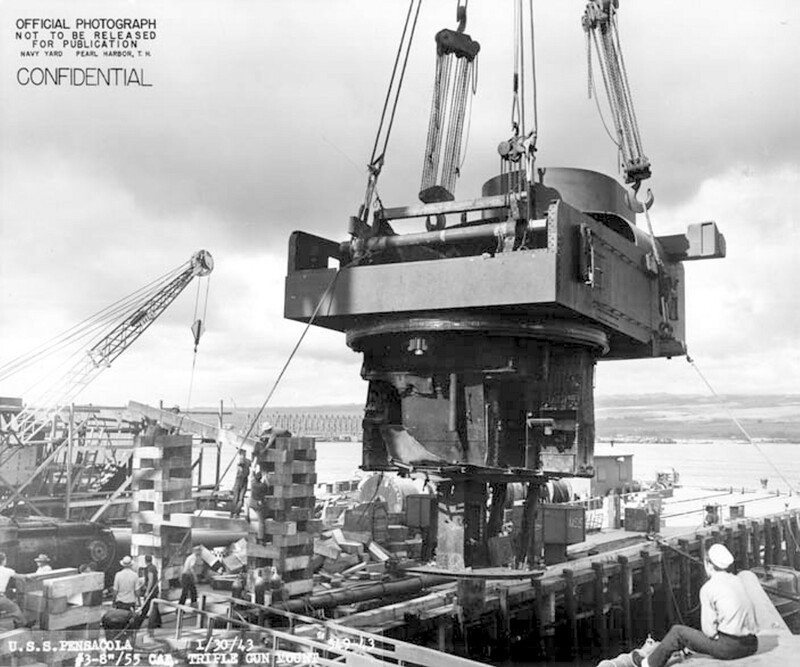 Removal of 8" turret #3 while at Pearl Harbor Navy Yard on 29 January 1943. 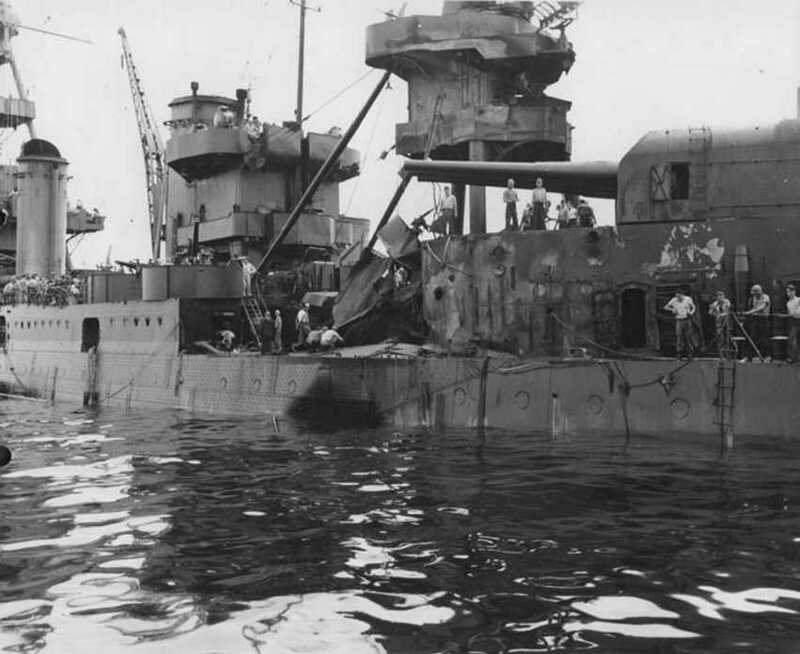 The turret was damaged during the Battle of Tassafaronga, off Guadalcanal on 30 November 1942. 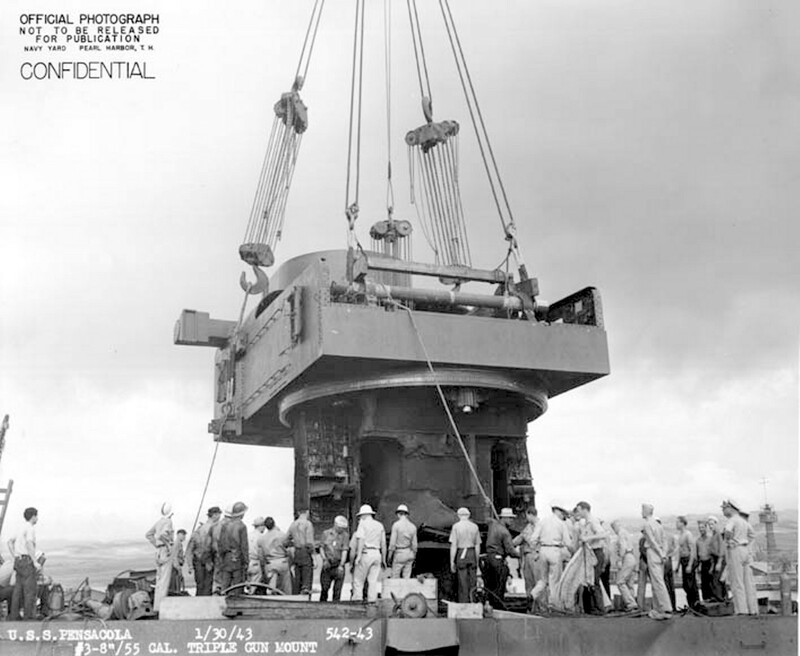 Removal of 8" turret #3 while at Pearl Harbor Navy Yard on 29 January 1943. 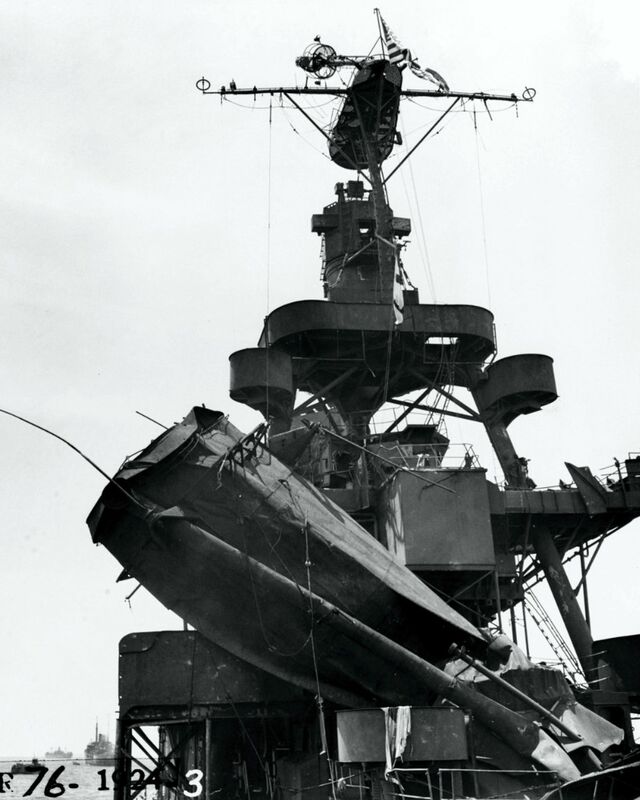 The turret was damaged during the Battle of Tassafaronga, off Guadalcanal on 30 November 1942. 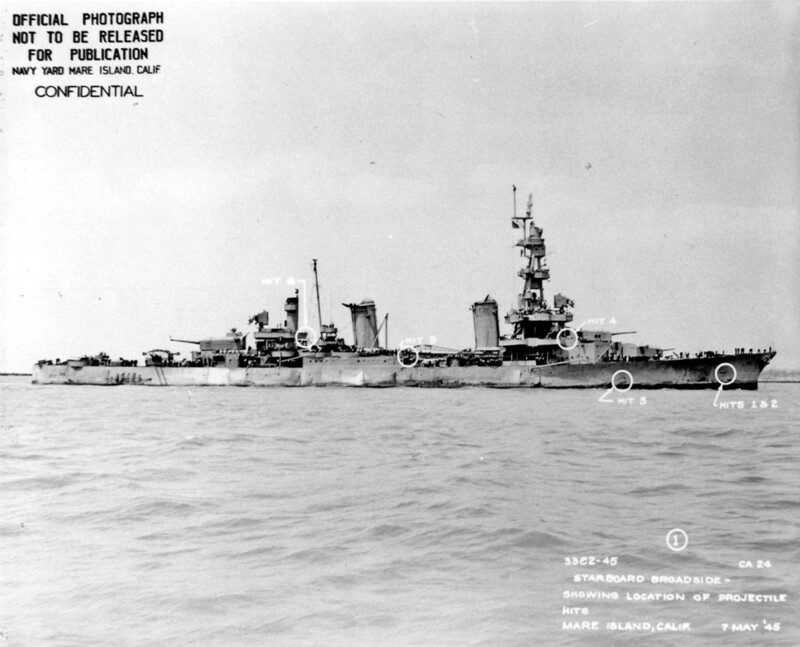 Righting operations for the overturned USS Oklahoma (BB 37) can be seen in the distance. 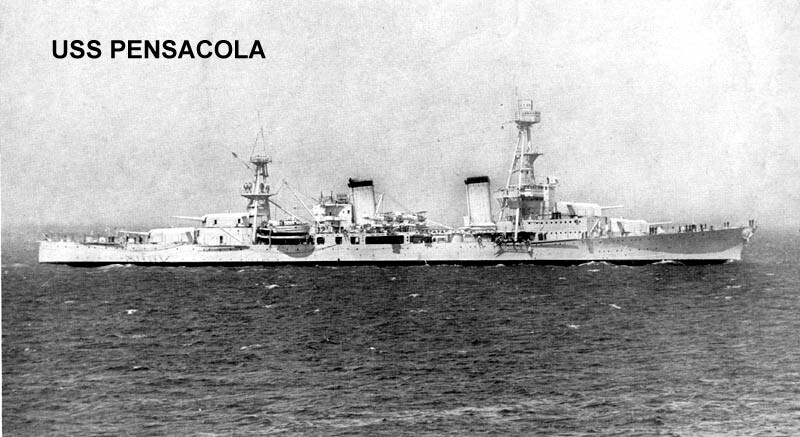 USS Pensacola (CA 24) Photographed on 14 October 1943. She is accompanied by two tugs, one small harbor type and the other (at right) an old Navy fleet tug. 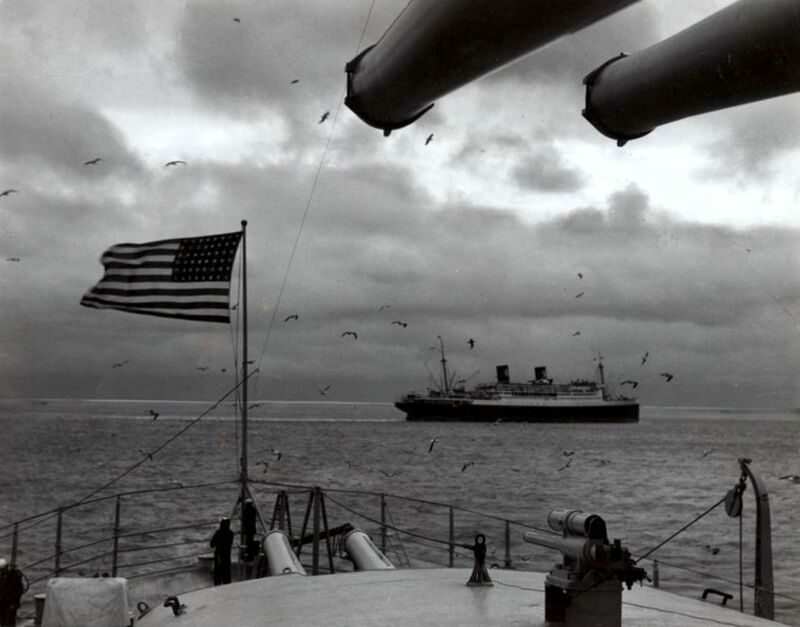 Photograph from the Bureau of Ships Collection in the U.S. National Archives #19-N-67932. 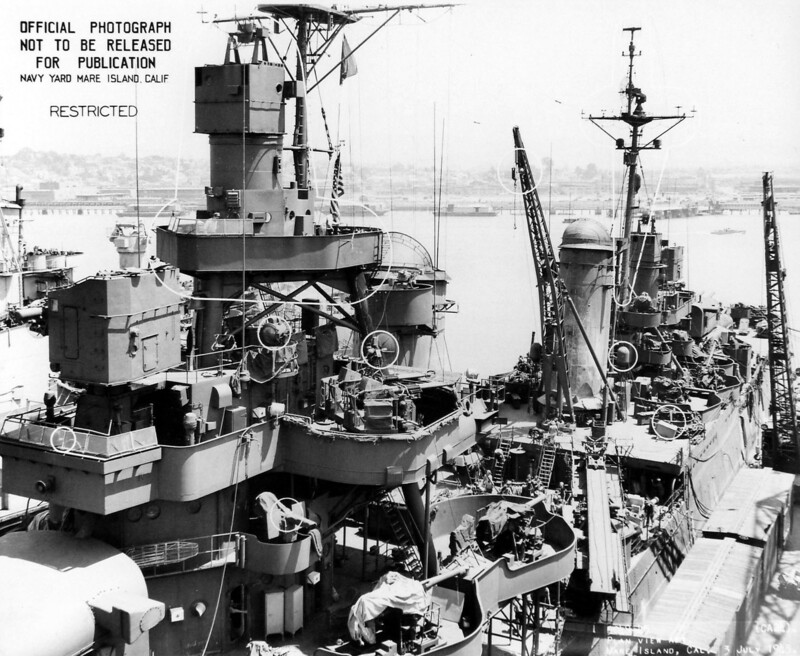 Amidships looking aft plan view of USS Pensacola (CA 24) at Mare Island on 20 May 1944. 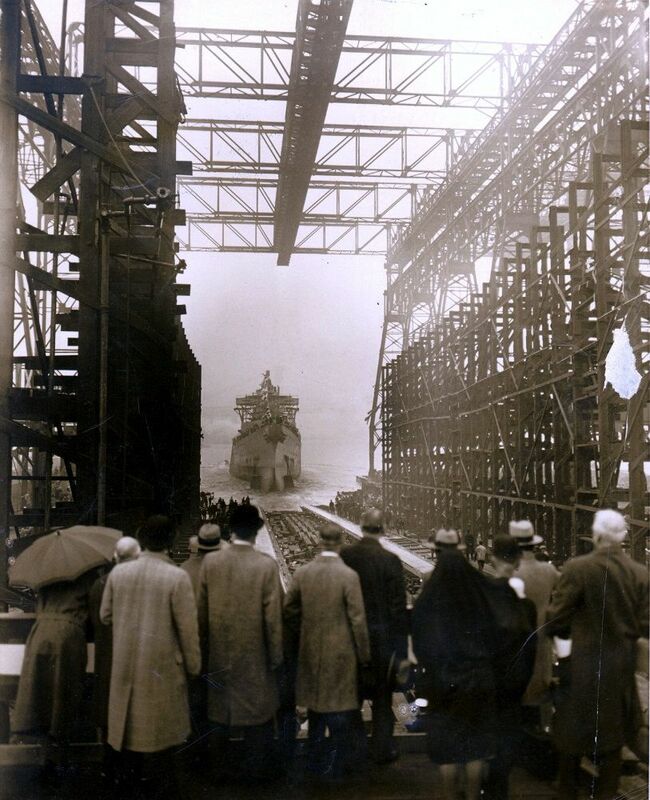 She was at the shipyard for repairs from 6 May to 20 May 1944. Stern view of USS Pensacola (CA 24) departing Mare Island on 20 May 1944. 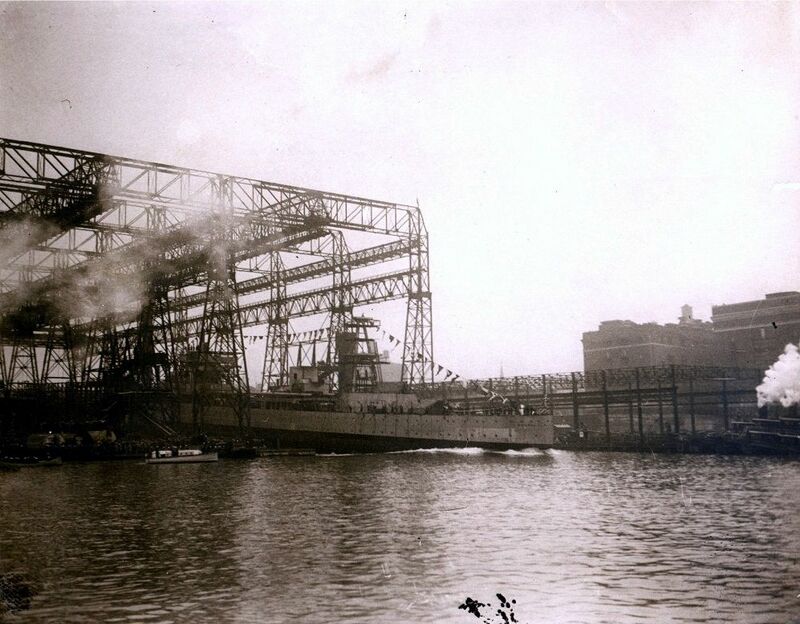 She was at the shipyard for repairs from 6 May to 20 May 1944. Note the LCT's to the left. Identifiable among the craft are 1071, 1074, and 1292. Contributor Tom Rickels' father, Ens. Gerald H. Rickels, was assigned to LCT (6) 1071, where he was the XO and later OinC. 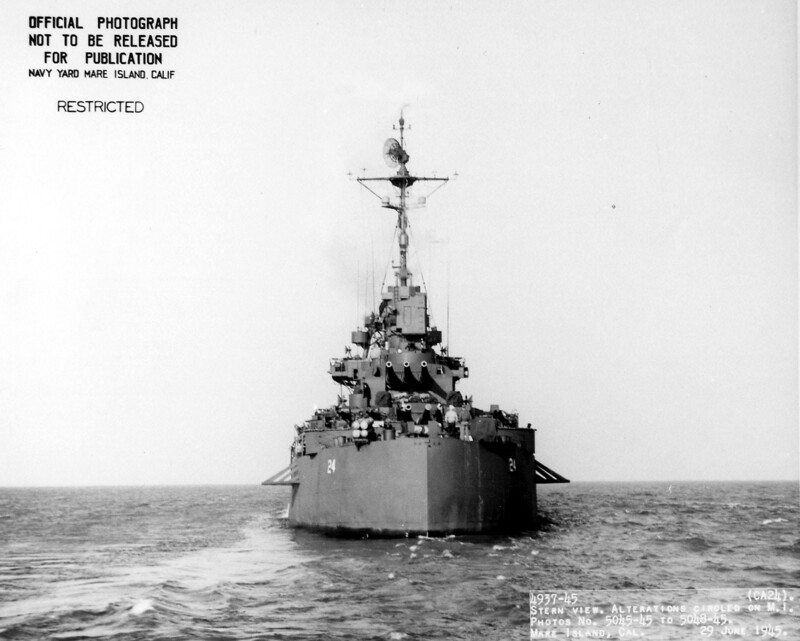 Bow on view of USS Pensacola (CA 24) departing Mare Island on 20 May 1944. 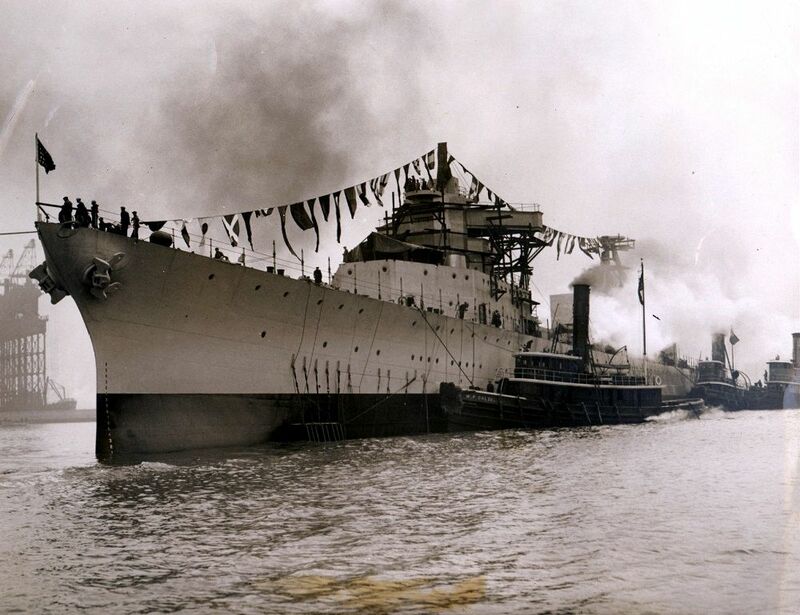 She was at the shipyard for repairs from 6 May to 20 May 1944. USS Pensacola (CA 24) In Massacre Bay, Attu Island, Alaska, 9 June 1944. She is painted in camouflage Measure 32, Design 14d. 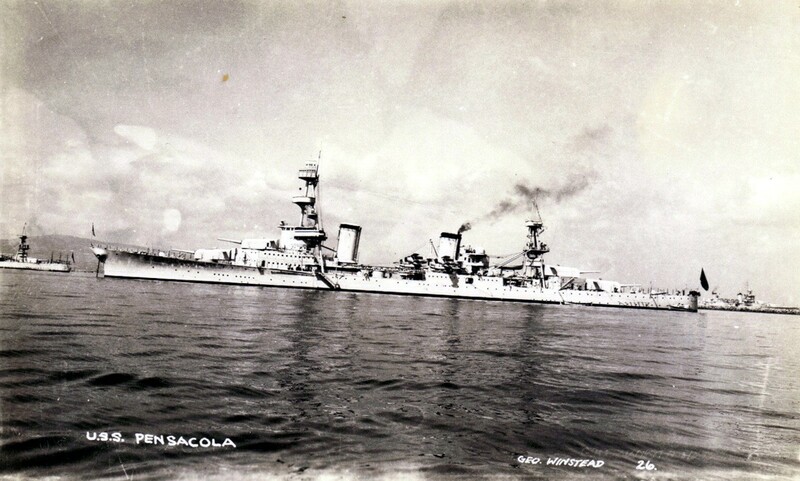 Official U.S. Navy Photograph, from the collections of the U.S. Naval Historical Center #NH 97839. 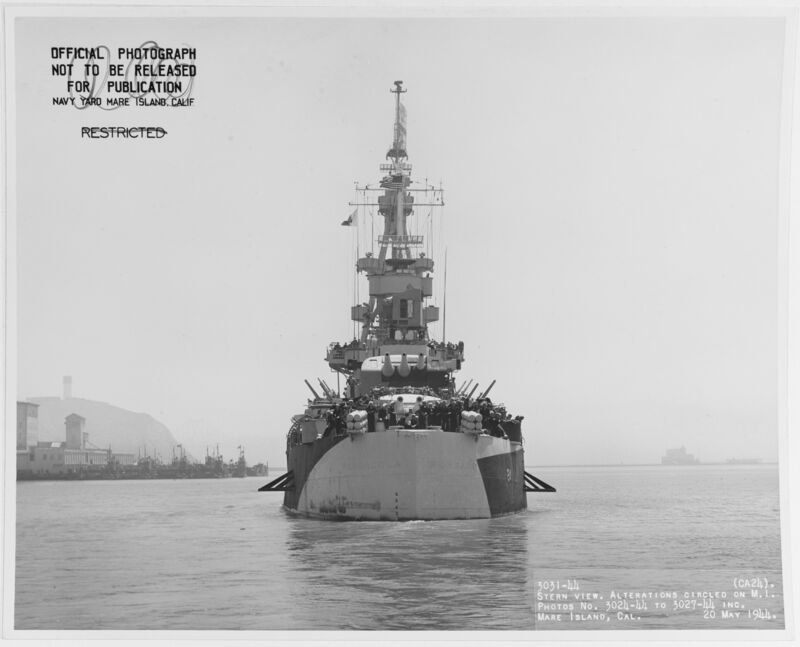 Broadside view of USS Pensacola (CA 24) off Mare Island upon her arrival for overhaul on 7 May 1945. The photos show locations of projectile hits received off Iwo Jima. 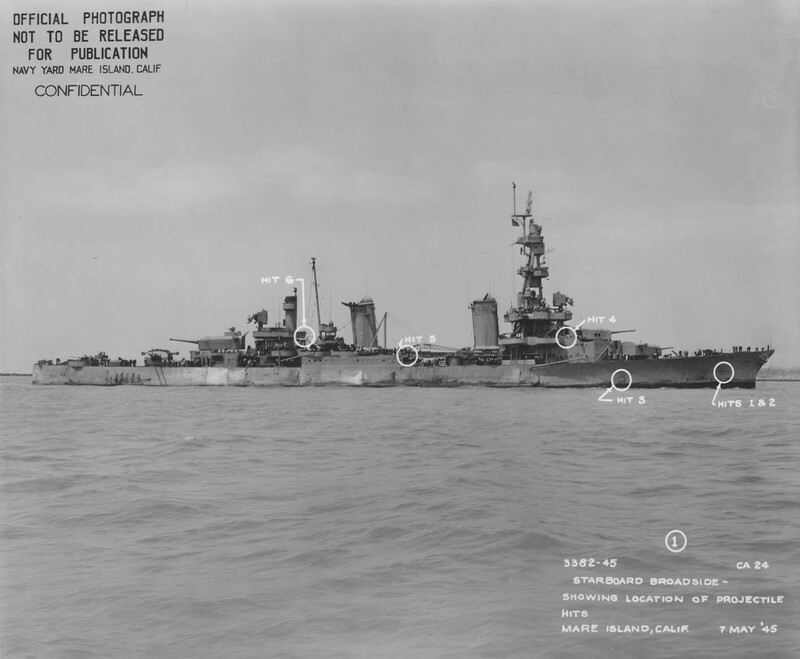 Starboard broadside view indicating the location of projectile hits sustained while operating off of Iwo Jima on 17 February 1945. 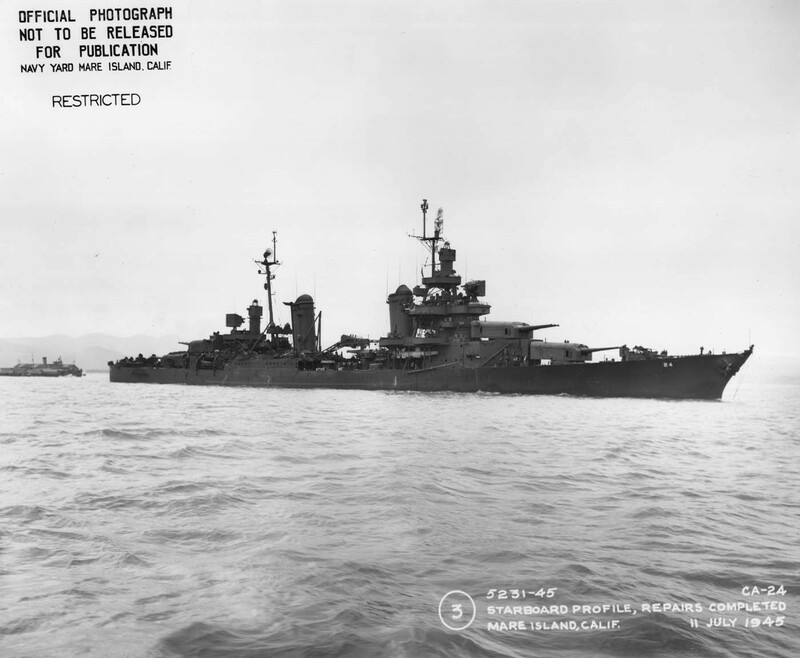 Photo was taken on 7 May 1945 while off Mare Island, CA. 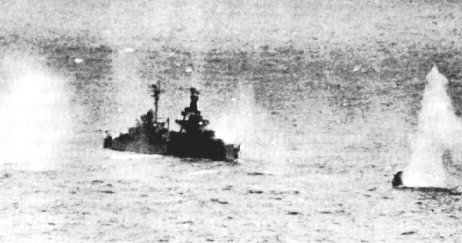 View of projectile damage. 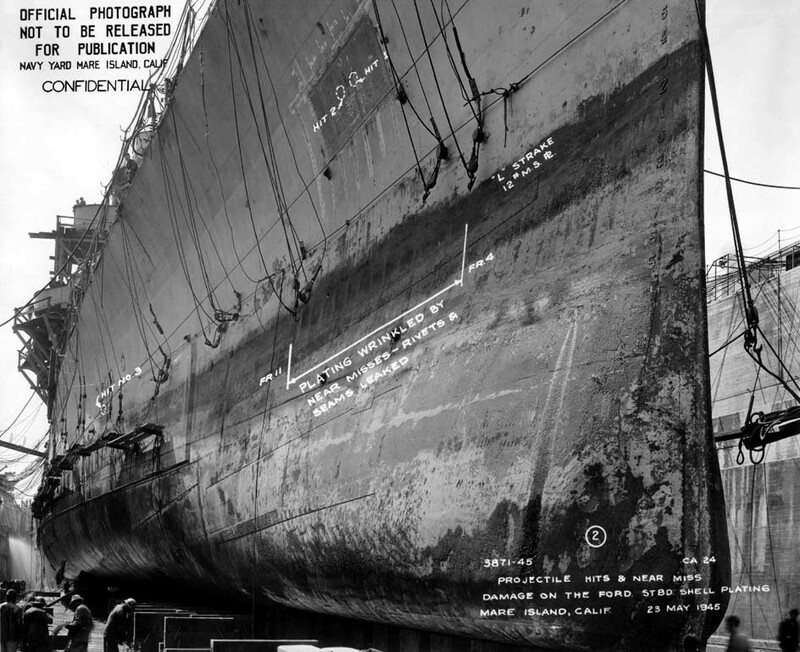 Photo was taken on 25 May 1945 while drydocked at Mare Island, CA. 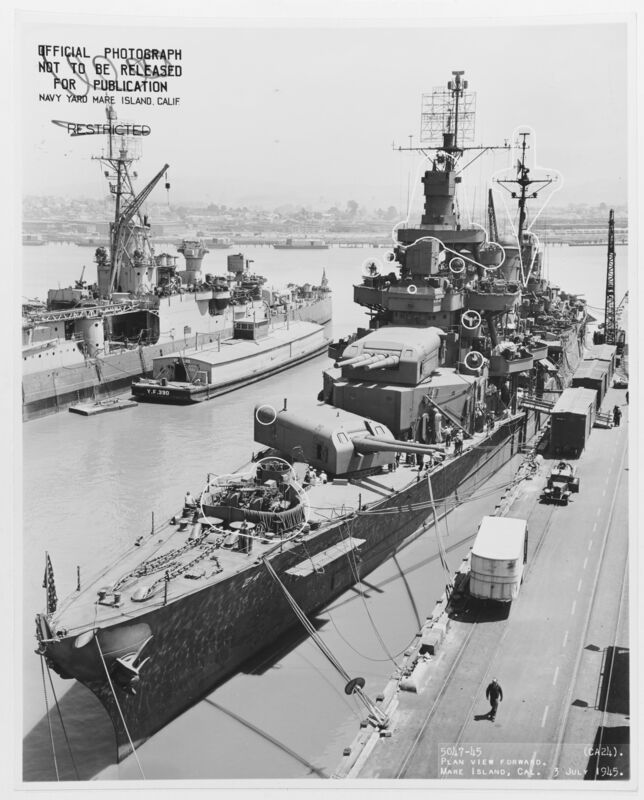 Port broadside view of USS Pensacola (CA 24) off Mare Island Navy Yard on 29 June 1945. The ship has just completed her final refit. During this refit the tall tripod foremast was cut down, the tripod mainmast was replaced by a short tower, 40mm A.A. guns have been added at the bow, #1 and #4 turret range finders were removed and the starboard catapult was removed due to weight and stability problems. 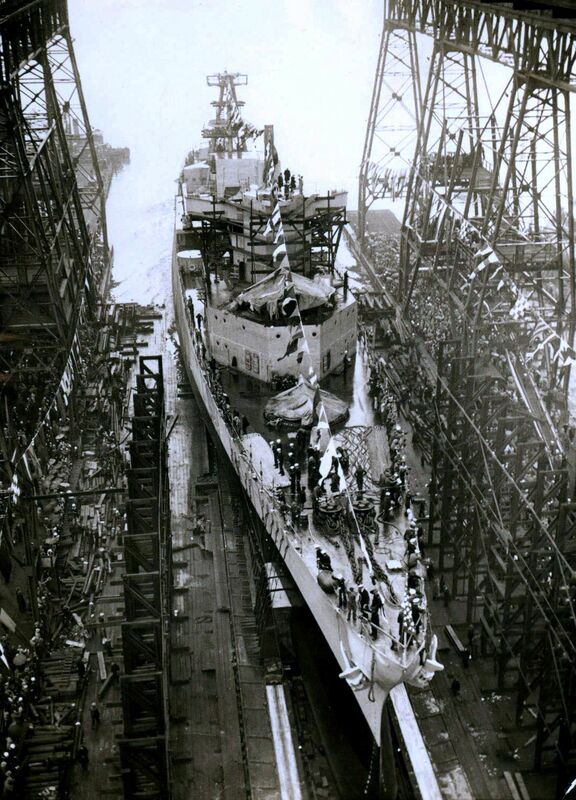 This was the final cruiser refit of WW2. 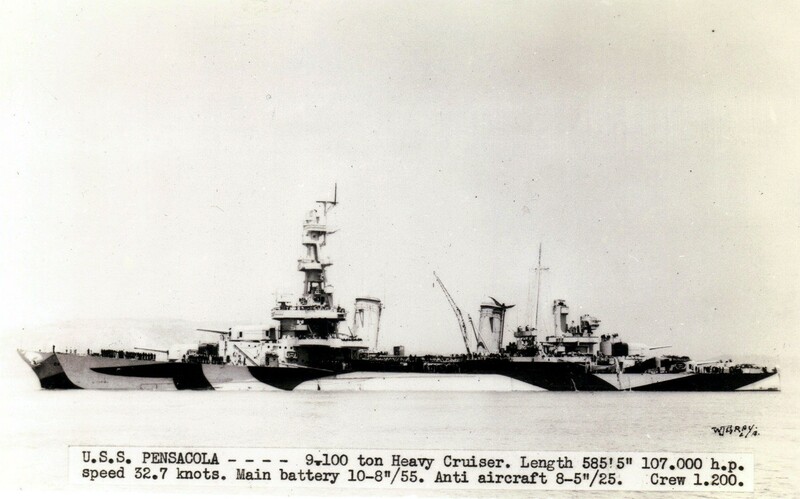 The Pensacola is painted in MS21 camouflage scheme. Bow view of USS Pensacola (CA 24) off the Mare Island Navy Yard, 29 June 1945. 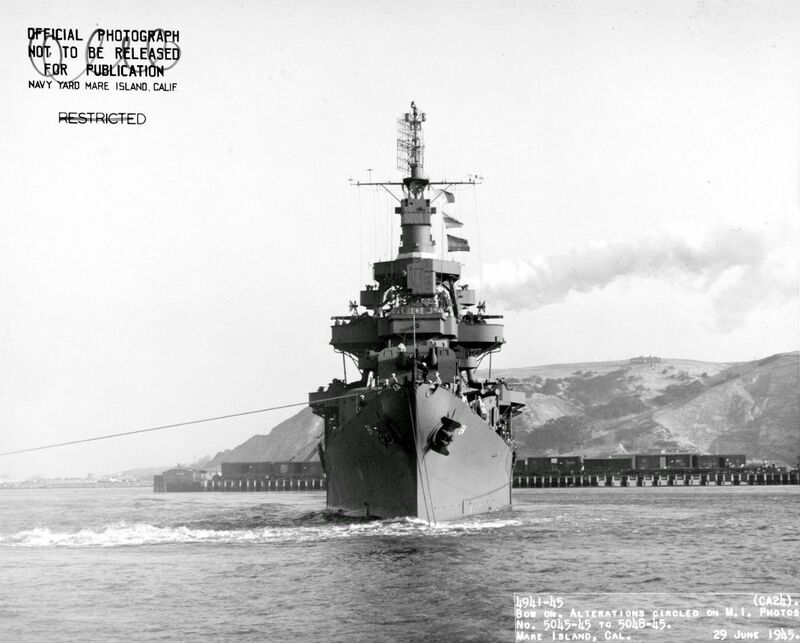 Port quarter view of USS Pensacola (CA 24) off the Mare Island Navy Yard, 29 June 1945. 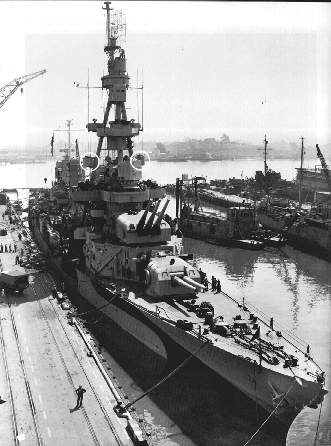 Starboard side view while off Mare Island after completion of repairs. Photo taken on 11 July 1945. USS Pensacola (CA 24) Off the Mare Island Navy Yard, California, 29 June 1945. 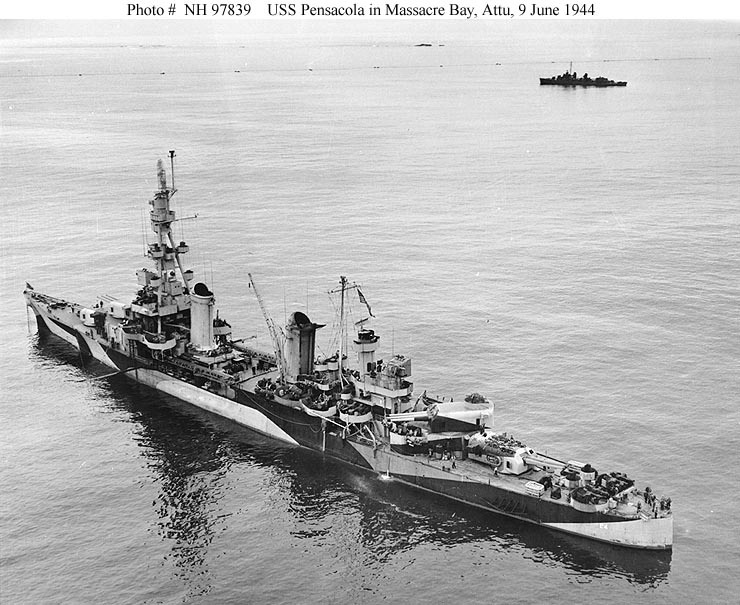 Stern view of USS Pensacola (CA 24) off Mare Island on 29 June 1945. Amidships looking aft plan view of USS Pensacola (CA 24) at Mare Island on 3 July 1945. 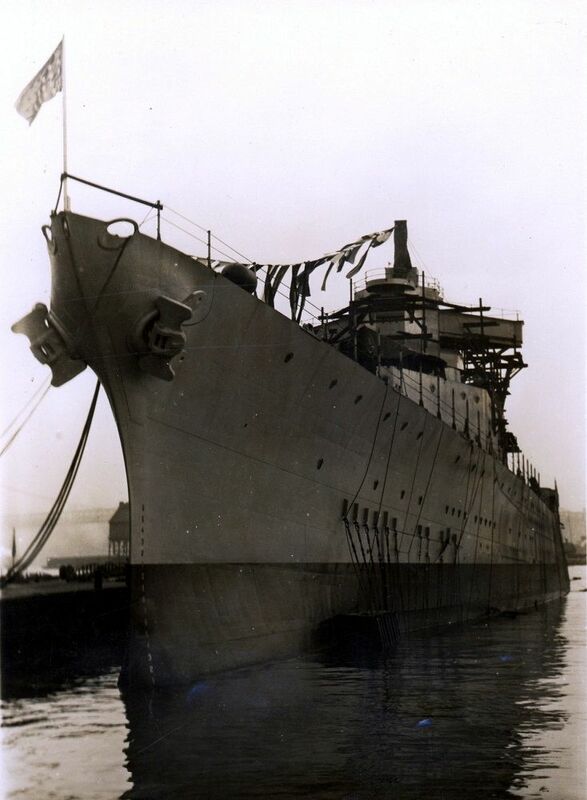 She was in overhaul at the shipyard from 7 May to 11 July 1945. 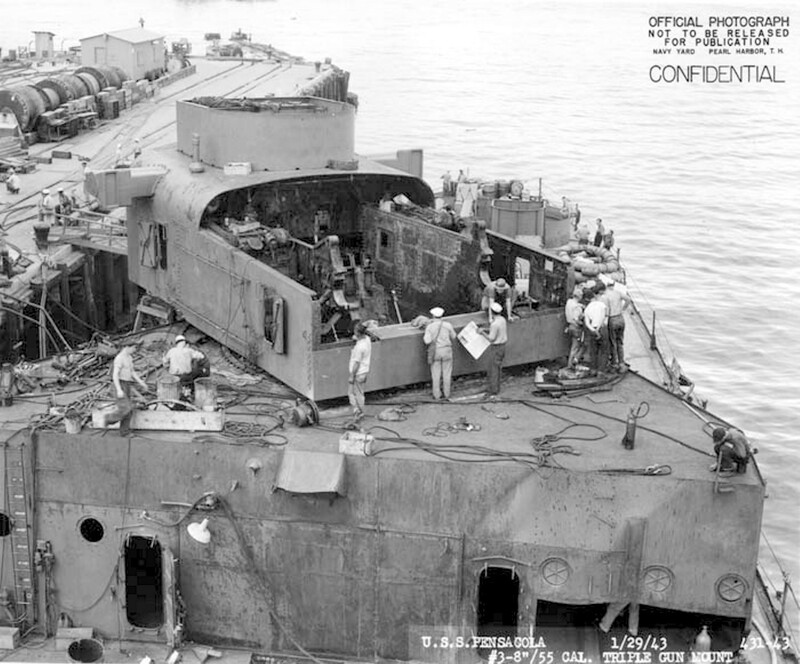 USS Pensacola (CA-24) View on the ship's afterdeck, looking forward, showing damage inflicted during the Operation "Crossroads" atomic bomb tests at Bikini, in July 1946. 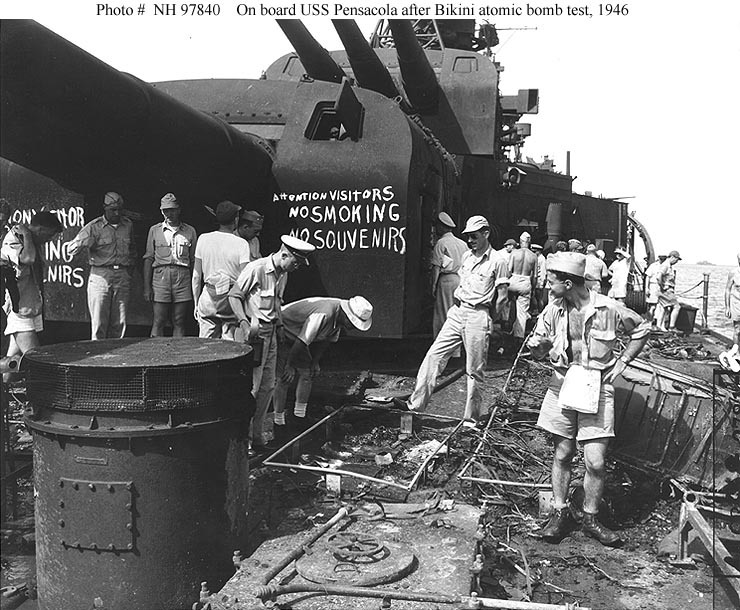 Men in the foreground are examining the remains of equipment placed on her deck to test the effects of the bomb explosion. 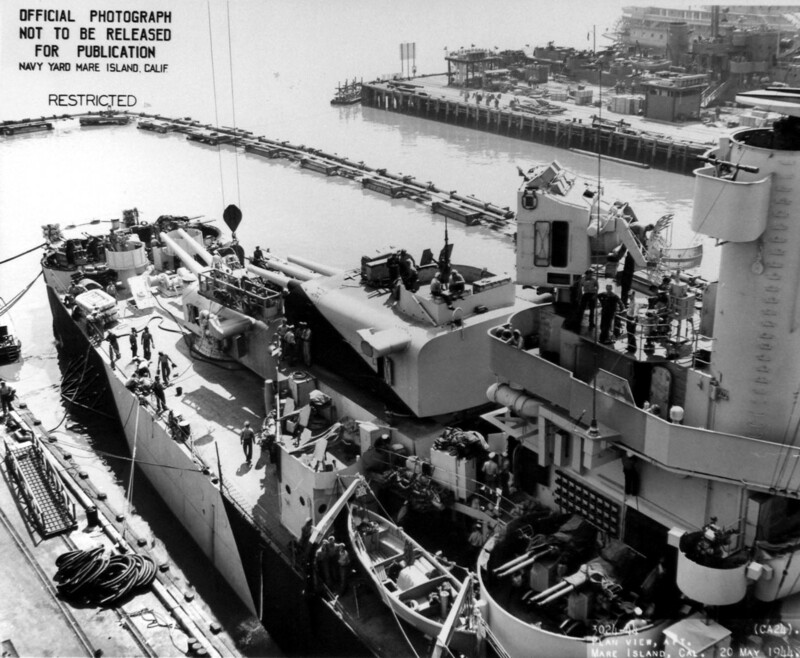 Note the caution signs painted on her after eight-inch gun turret, presumably to reduce fire risks and prevent the taking of radioactive items as souvenirs. 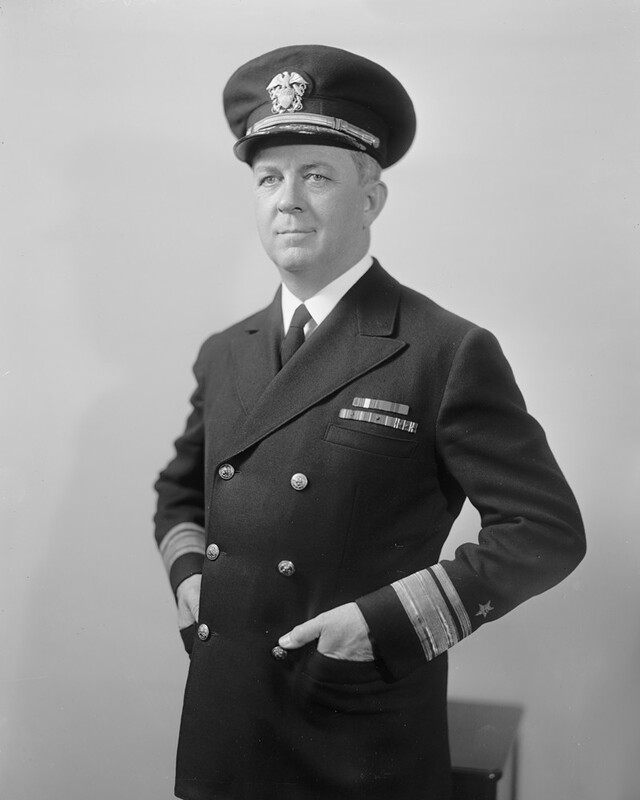 Official U.S. Navy Photograph, from the collections of the U.S. Naval Historical Center #NH 97840. 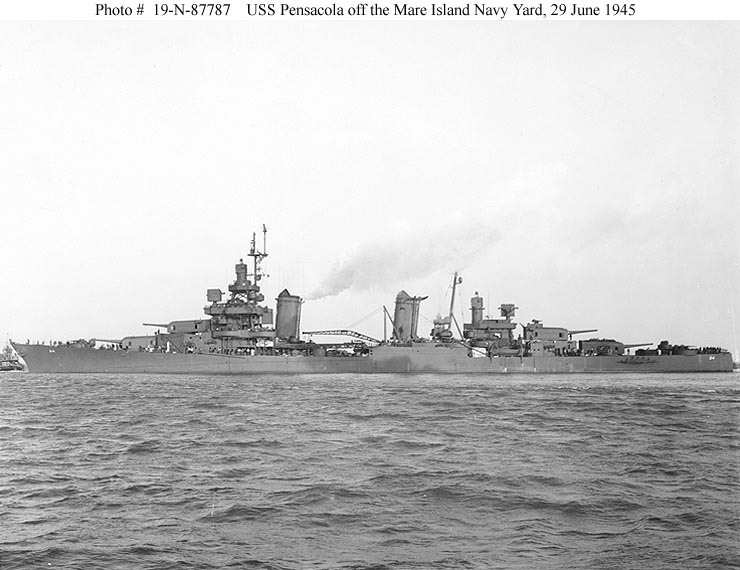 USS Pensacola (CA 24) on 4 July 1946. 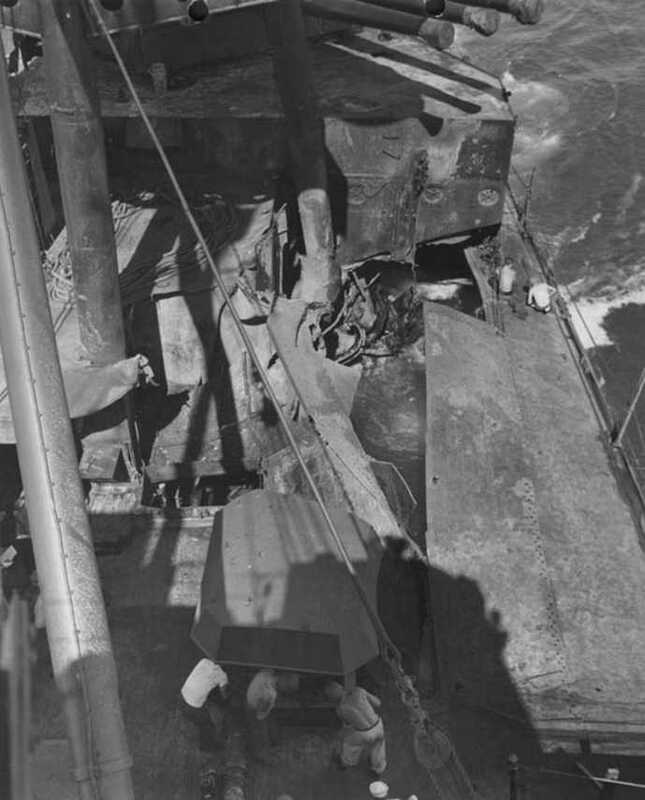 Photo shows damage to stack and foremast, received during the "Able" blast of the Bikini atom bomb tests. 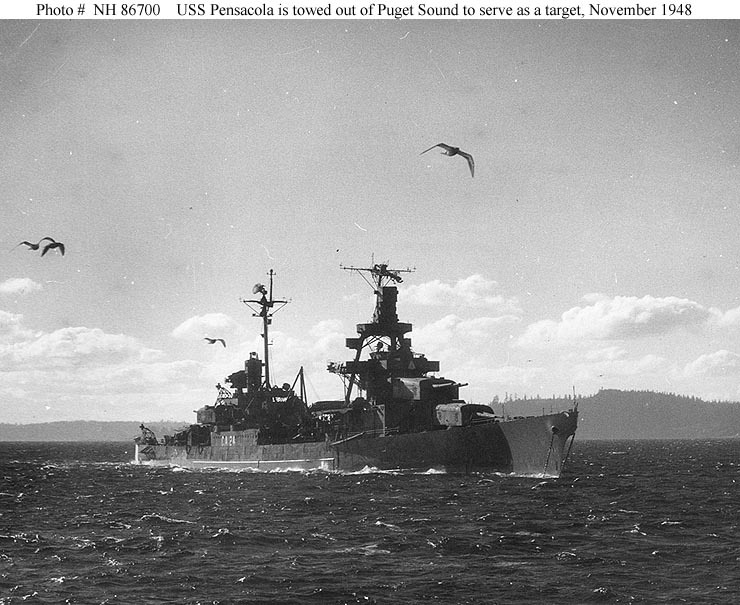 USS Pensacola (CA 24) Is towed out of Puget Sound, Washington, en route to sea for disposal as a target in First Task Fleet exercises, 9 November 1948. U.S. Naval Historical Center Photograph #NH 86700.